The recent Cablegate Wikileaks release of hundreds of thousands of cables from U.S. diplomats is more than just a massive “leak”. It is an elbow point, a no-turning-back further realization that our global internet web is forever changing the public/private/secret landscape generated by the informational artifacts we produce. It reminded me of a prescient comment written way back in 1973, in what could be called the dawn of the public web, which was Community Memory, the world’s first public computerized bulletin-board and info-flea-market system. This comment also suggests how the net of information can provide a virtual layer of tracking of the effects of our actions on our planet, and how that could be an ongoing container for wealth as Buckminster Fuller defined it: sustainable forward days of survival. We supply the planetary common wealth in acting in total communication with our various actions and their respective back and forth sequencings. Where we get stuff, what we do with it and how, and where it goes afterwards – staying in touch with such data is what constitutes wealth, survival possibility – and this information flow is the crucial missing link in the survival worthiness of ourselves-together-with-our-planet. The medium for this release of valuable (valued for livelihood) messages is developing amongst us – electronics media in general, basically, and specifically public accessible memory storage – leave your real-time messages for other people, and you begin to provide other people access to your history, your calendar, your time(s). We all get “on the air”. Whether this is claustrophobia, or intolerable honesty, or space of shared patterns-of-common-history; whether this requires our becoming more and more like public parks, or whatever – is up to us to create. There can be no doubt, though, that at the least, the very least, we are being thrown communicationally together. I’ve been exploring Second Life recently, and continue to be amazed at how compelling and real the emotional experience is. I know that these avatars, including myself, are slightly cartoony 3D-ish figures, but the quality of interaction seems just as real as in, uh, Real Life (which is what SLers call the life you who are reading are in (but what if you’re reading this in Second Life?)). This is a real tribute to brain neuroplasticity (example: an amputee’s phantom limb pain can be reduced by watching a therapist’s arm in the location where their arm would be, which seems to restore missing feedback loops): mirror neurons at work. Second Life also has a dreamlike quality, partly due to the fact that you can fly in SL, and flying is often associated with flying while lucid dreaming. And in dreams the bodies and forms are as illusory as in Second Life, but also as emotionally real as in waking life. But the brain neuroplasticity example shows that my sense of the reality of my arm in “Real Life” is also illusory! 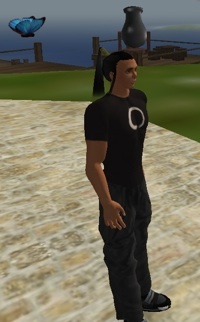 And then Second Life has further twists, such as the default viewpoint, which is slightly above and behind my avatar – slightly out-of-body. Add to this Analog Sundays – this is something my wife and I have started doing: no computers on Sundays. That’s also a really interesting, different experience: Third Life? My “Real Life” is actually a mixture of analog and on-line life, so going analog-only for a whole day is a sensory experience in itself. This is fertile ground for awareness practices such as that of Illusory Body (one of the Six Yogas of Naropa). And reminiscent of the butterfly dream of Chuang-Tzu, where he couldn’t tell if he was Chuang-Tzu dreaming of a butterfly, or a butterfly dreaming of Chuang-Tzu. My first, inadvertent experience of lucid dreaming took this form, with the terrifying experience of really not knowing whether I was actually awake or had woken into yet another dream. The consolation, of course, is the Buckaroo Banzai saying, wherever you go, there you are (although Thomas à Kempis said it in 1440, as have many Buddhists in just so many words over the last 2500 years). Identity: as Bucky Fuller said, I seem to be a verb. DIME weapons are very effective at shredding people in confined spaces. If you kill enough of your enemies it will lead to victory. Short of extermination, that’s false. War is not chess: it’s not about the king. You can target leaders, but they keep emerging. Our Lady of the Ayatanas is Jill Barber. Listen to her perform Saskatoon for CBC Radio. This song was written in 15 minutes while waiting to come on stage somewhere in Central Canada, land of the prairies. It is very simple, starting with her husks of wheat voice, recapping the stars, the sky, the seasons, the heart of the prairie weather cycle. By verse two something has shifted, and we feel we are there, we are her, her voice is that of the spirit of that place, and she for the moment its embodiment. The ayatanas (see Vastness in the Minute Particulars) are the perceptual worlds we inhabit – the mutual coupling of sense organs with sense objects, and the qualities of those perceptions. More than that, the ayatanas are limitless, metaphorically onomatopoetic, harmonizing, arousing, breathing. Art has a way of connecting us to that, of becoming its symbol, of participating in its reality. Shakespeare slays us with two words, cutting to the human; Mozart finds and celebrates the sad and humorous truth in our deceptions. If you are able to relax – relax to a cloud by looking at it, relax to a drop of rain and experience its genuineness – you can see the unconditionality of reality, which remains very simply in things as they are, very simply. Jill Barber has a gift for connecting with that, and for transporting it in echoes of sound and emotion. But she does more than connect: for a moment she captures that drala, or it captures her; it enters her music, and that music is its. That spirit of the prairies has found her, and she is its child, and more that that: she is that drala. This is how the world works. You can tune in to it in Saskatoon. You can find it where you are. You can hear it in Jill Barber. Google Gears, SyncML, or something like it, is a huge winner. Why? It enables a web where information is cached wherever it is used. As you’re using a web page / visiting a node, you can choose to have the information there cached onto whatever client you happen to be using. If access to the web is interrupted, you can keep working locally, and then re-synch with the web when back online. The stuff on your client is up-to-date with the web whenever you use it online. Google Gears is currently available for Google Documents (as well as Reader and soon Mail and Calendar). Overall, with such caching the web is asynchronously up-to-date. If you haven’t used a client for a while, that node’s cache gets old. But use it, and it’s back in synch. Specifically, wherever you are the web synchronizes with you, just in time. Overall again, this is very efficient. Unlike an application, which gets installed on the client just-in-case, your web cache (which includes your browser and its extensions) gets installed and updated when-needed, where-needed. Your local machine backs up to the web, and the web updates your local machine. This could be very robust, and also feels a lot closer to something living. As Buckaroo Banzai would have said, wherever you are, there’s the web. Apple’s Remote iPhone app is a true jewel: it does one thing really really well. In my case, I have an iMac upstairs in my home office, wirelessly connected over AirTunes to my downstairs speakers. Now I can be in the kitchen and, with the Remote iPhone app, see all the songs and podcasts on my iMac, including cover art, and select the piece I want to play, as well as setting the volume for it. Simple, brilliant, just right. It does have one gotcha – you have to “pair” it with your iTunes library so it knows which library to connect to over WiFI, and to do that you have to be tethered (by USB cable) to its Mac (or PC). This is something the app does not make clear – it says to go to iTunes and find your iPhone listed under Devices: well, Devices doesn’t appear if the iPhone is not cabled to the machine, and, being in a wireless mindset, you may not expect to have to physically connect. Yeah, I know, magical thinking. But, design is also how to get it working. But there’s a much bigger implication here. We’re entering a world where the desktop is disappearing, to be replaced with computing devices everywhere (ubiquitous computing), whether you can see them or not. The handheld device, the one that you carry with you or is part of you, has a huge role to play here: as the universal controller for all the devices in your immediate context. As you walk into a space, you should be able to have all the computing devices there adjust themselves to you, and be driven by you, so that you can make use of the limitless computing, communicating, and visualizing power they offer. Every room can be your situation/war room. And the device to bind them all? It’s the one you have on you. The iPhone is the first sign of that. Evan Prodromou‘s open source Twitter-like site identi.ca supports OpenID for logging in. This basically means that if you have set up an OpenID with an OpenID Identity Provider, and you want to sign in to a site that supports OpenID login, that site sends you back to your Identity Provider site to authenticate with your password, waits for your Identity Provider’s secure handshake verifying that you really do own that OpenID, and then lets you in. The key: your Identity Provider is the only site where you enter the password for your ID. This is a huge win, and avoids some evil anti-patterns. A bonus is that you can use that same OpenID with multiple sites, and none of them needs to know your password. This also means that Single Sign On is really easy. 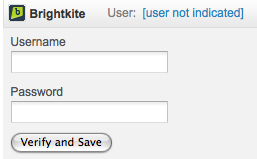 Since I’m already registered on identi.ca with an OpenID, I choose that option, and am asked to enter my OpenID. 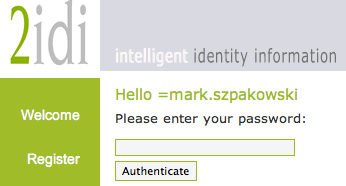 In my case I’m using the iNames form of OpenID (=mark.szpakowski), which I type into the form. Note that there is no password field! When I click the Login button, I am taken to my Identity Provider, 2idi.com. That is the only site to which I ever present my password! I enter my password there (if I need to – if I’d previously authenticated here, and my session here was still alive for my current browser, 2idi would not need this step to know who I am! ), and then 2idi and identi.ca perform some handshaking in the background which assures identi.ca that I am indeed =mark.szpakowski, and identi.ca logs me in. This is scary! As Earle Martin says, “hello.txt is also full of password antipattern. I don’t think so…”. Do I really want to enter all my usernames/passwords for all the sites I belong to on some other site’s page? If my sites supported OpenID, this could be deftly avoided: I simply enter the OpenID I use for each site, but I only type in my password on my trusted OpenID provider site. And in fact after the first time I do so, I don’t need to re-authenticate with my password as long as I don’t close down my browser session. The preceding has been a public service announcement…. Financial markets live on price-inflating bubbles? Money supply is the monetary base times the velocity of money. The first is how many dollar bills and dollar deposits are in circulation. But the latter is how many times each dollar (virtual or physical) circulates in a year. The Fed can control the first – but it cannot control the second. 50 years ago a dollar bill changed hands perhaps four or five times a year. Then, when business began to be done by credit cards, this rate increased dramatically. And today, when many individuals and corporations pay their bills online, where payments are super-fast, the velocity of money has soared yet again. So even if the Fed withdraws some monetary base, it is that second part of the equation that today matters most. Furthermore, that research also showed that once money velocity approaches instantaneous, the money supply tends toward the infinite. But because there are not that many opportunities, this electronic money latches on to anything with a credible story and moves fast into the new category. This movement starts the category moving – which causes more hot money to slosh into it – which in turn causes Wall Street to satisfy the money-slosh by generating more product. The most recent such bubble was subprime mortgages, which were sliced and diced and packaged, then traded electronically – until they crashed. Now we are seeing the beginning of a commodity bubble. So we’ve had the dot com bubble, housing, commodities (food! ), and now possibly energy. If this is true, then we have uncontrolled systemic forces artificially inflating prices, creating wealth for a few, and suffering for literally millions. If it is true, it is costing the world billions, if not trillions, let alone human lives – surely changing or stopping this should be a number one and immediate priority. So how can we validate, verify, and graphically communicate this? Can Global Sensemaking tools, Gapminder, et al help? Is this a critical acupuncture point that needs immediate confirmation and decisive intervention? Are there other global systems effects that are operating on their own, like Artificial Intelligences not obeying the three laws of robotics? Ever since the human race first appeared on this earth, we have used this earth heavily. The earth has given us immeasurable benefit, but what have we done for the earth in return? We always ask for something from the earth, but never give her anything back. We never have loving or protective thoughts for the earth. Whenever trees or anything else emerge from the ground, we cut them down. If there is a bit of level earth, we fight over it. Now the time has come when the earth is scowling at us; the time has come when the earth is giving up on us. The sentient beings living on the earth and the elements of the natural world need to join their hands together—the earth must not give up on sentient beings, and sentient beings must not give up on the earth. Each needs to grasp the other’s hand. So doesn’t the Monlam [prayer festival] logo look like two hands clasping each other? We will not give up on the earth! May there be peace on earth! May the earth be sustained for many thousands of years! These are the prayers we make, which is why this symbol is the logo of the Kagyu Monlam. I also think this might become a symbol of people having affection for the earth and wanting to protect it. It is first and foremost a symbol that we are not giving up on the earth. I’m in – we need symbols, especially those with such sentiment that gets right to the core: the sentient beings living on the earth and the elements of the natural world need to join their hands together.